How to save money on food by planning ahead. After rent, food is what I spend most of my money on. I cook as much as possible during the week (testing recipes and eating tried-and-true meals) so that I can save up for going to interesting restaurants over the weekend. 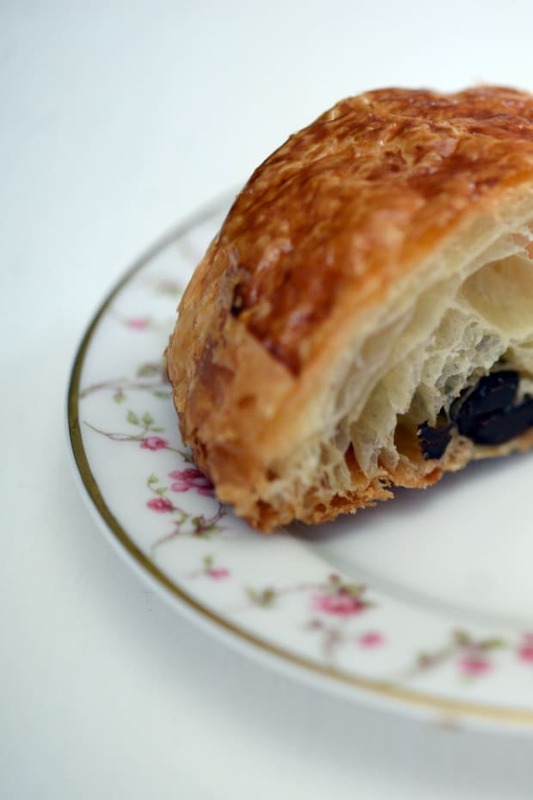 Recently, I’ve been even more careful about eating frugally since I’m traveling to Paris in March and want to be able to eat as much amazing food there as possible. If I’m meeting friends for drinks, I make an effort to plan ahead and eat dinner at the office beforehand so I don’t end up dropping an extra $15 on dinner, and my boyfriend and I have been recreating restaurant dishes at home to dissuade us from eating out. I should also probably mention that I’ve been training for the L.A. Marathon in March, so what I eat during the day is usually dictated by how many miles I run that day! 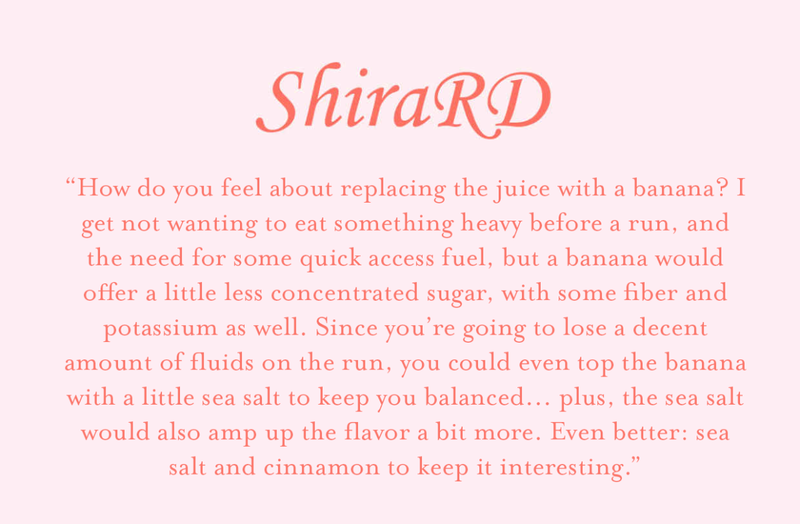 Here’s my food diary from a recent week, with commentary from Shira Lenchewski, R.D.—an L.A.-based nutritionist who we teamed up with for a series of healthy-eating posts on the blog as well as Emily and Alina&apos;s food diaries a few months back. P.S., I’m drinking water constantly, so I only mentioned the times I drank anything besides water! 8:15 a.m. - Orange juice with a splash of yuzu. This morning, I went on a 6.5-mile run through the rain and felt really lethargic and all-around not great afterwards (I never eat before running since it gives me stomach cramps while running). Since I was already running late, I downed a glass of orange juice with a splash of yuzu (a Japanese citrus that is like the best possible mandarin you could ever imagine) to get some Vitamin-C.
9:00 a.m. - Nespresso shot with whole milk and a little turbinado sugar. Needed caffeine this morning. P.S., I know highly acidic things on an empty stomach can really upset some people (it made Alina physically cringe when I told her I had orange juice and then coffee on an empty stomach), but I’ve never had any issues from it, thankfully! 9:30 a.m. - Plain yogurt and granola + raspberries, and Califia Farms&apos; almond milk coffee. 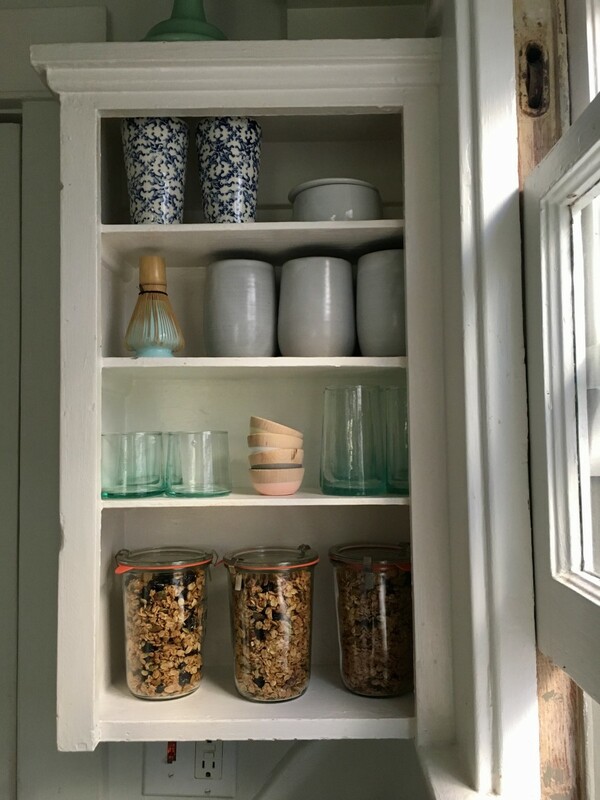 I almost always eat breakfast at home, but I waited till everyone was at the office this morning since I brought in granola I’d made that weekend, which we ate with yogurt and raspberries. It was delicious, if I do say so myself. 12:30 p.m. - Sandwich with wheat bread, turkey, cheddar, and mayonnaise. 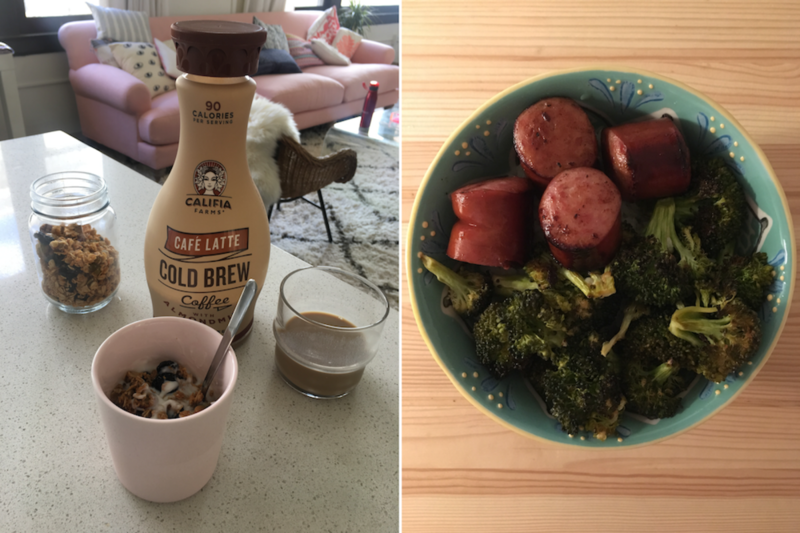 We didn’t do a great job of food prep over the weekend, so I ate what I could cobble together from my fridge and pantry this morning. 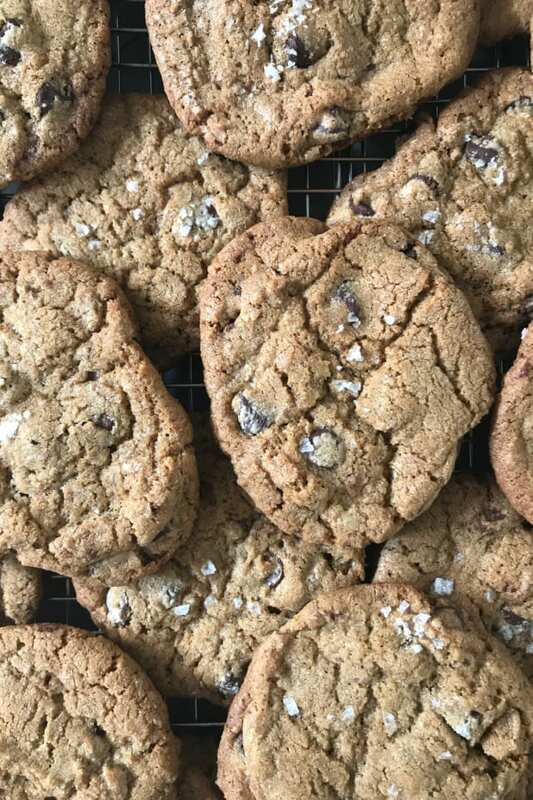 2:30 p.m. - Sugar cookies. Snacked on a few of these during a marathon editorial brainstorm, from a pack we got sent over the holidays. 8:00 p.m. - Rice bowls with polish sausage and Tahini Roasted Broccoli. 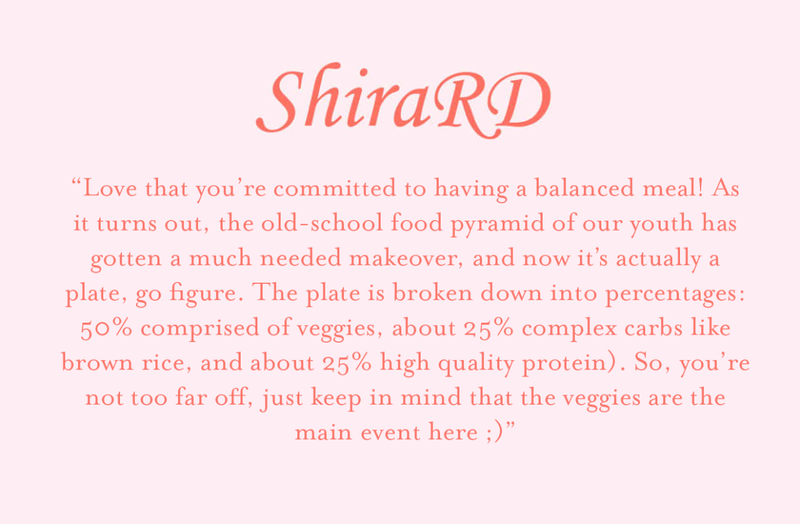 I always make sure my dinner incorporates a starch, lots of vegetables, and a protein—old-school food pyramid style—since that’s how I ate growing up and I don’t feel like a dinner’s complete without all three. Vegetable rice bowls with homemade Asian sauces are a go-to, lazy dinner for my boyfriend and me. We added sausages this time around because we were trying to get through leftovers that we brought camping the week before. 8:00 a.m. - Homemade granola with Greek yogurt, coconut nectar, and pear slices on top. 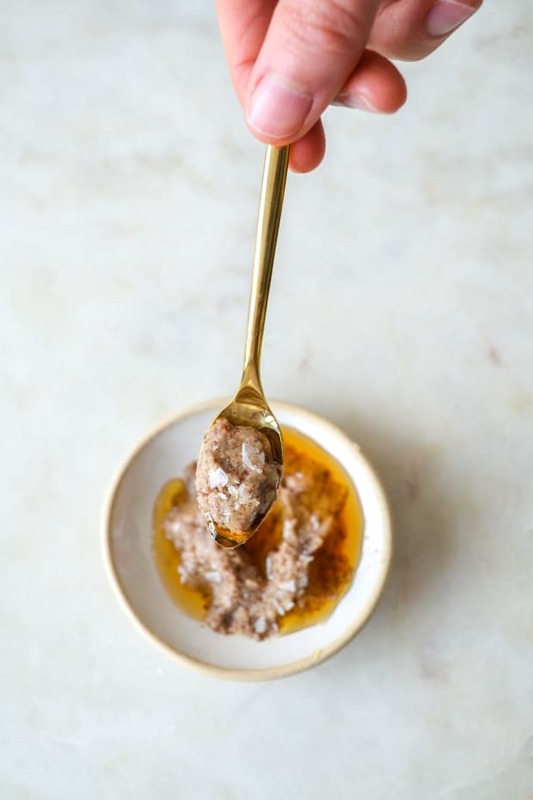 I read somewhere that agave nectar is just a highly processed high-fructose syrup that’s arguably worse than corn syrup, so I try to use alternative natural sweeteners (not sure if they&apos;re any better?). This was my first time trying coconut nectar, which is almost tart but was delicious with the sweet granola, which I had after a 5-mile run this morning. 9:00 a.m. - English Breakfast tea with whole milk and honey. 10:30 a.m. - Coffee with whole milk. Geoffrey makes amazing coffee, so I always opt for a cup when I’m working from their house. 2:30 p.m. - Quinoa with roasted veggies. Before leaving for work this morning, I threw some quinoa into a container with leftover roasted zucchini and carrots from the weekend. Quick and easy! 6:30 p.m. - IPA Beer at Happy Hour with friends. 8:30 p.m. - Smothered chicken and Gjelina’s brussels sprouts with bacon and dates. 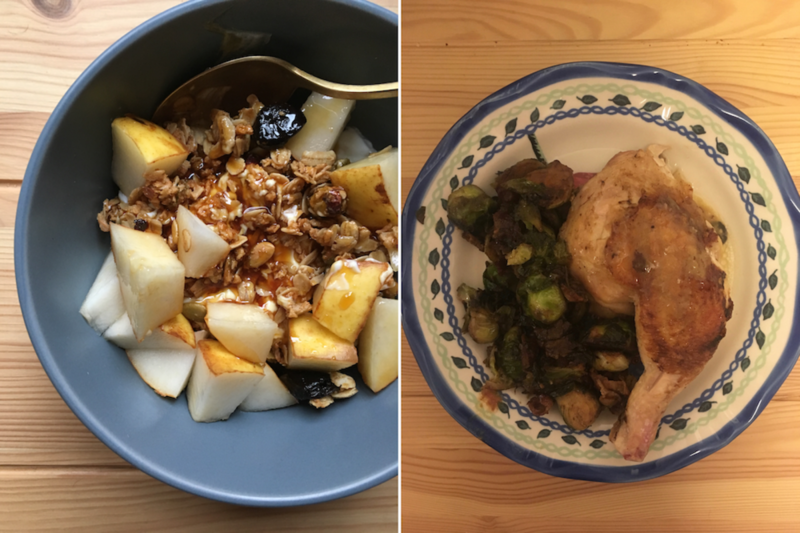 I’ve written about each of these two recipes in Leslie’s List and together, they create one of my favorite meals. It’s so satisfying and delicious that I didn’t even make a starch to go with it—I just ate my heart’s fill of chicken and brussels. I’m also lucky that my boyfriend was home early today so he was able to make dinner—otherwise I probably would have scraped something far less appetizing together. 10:15 a.m. - Homemade granola with plain yogurt + coffee with almond milk. I spent most of this morning prepping for my lunches and dinners later in the week, so I didn’t eat breakfast until I got to the office—sadly forgot to grab some fruit! 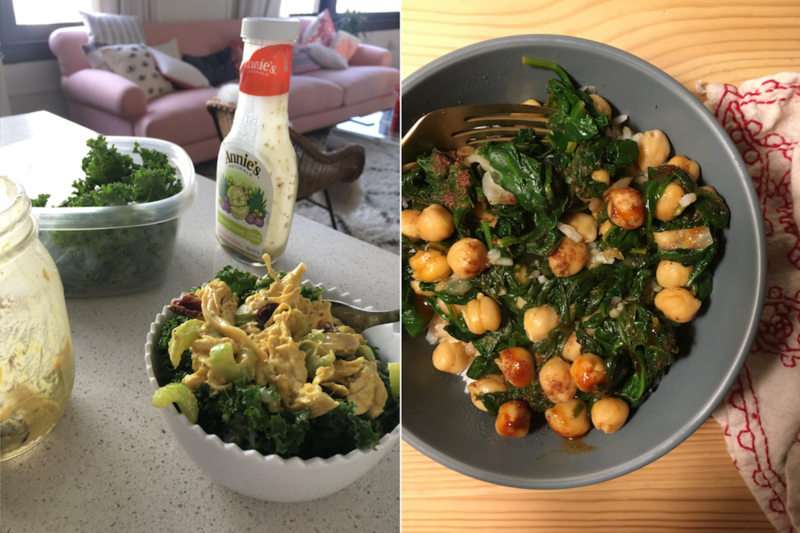 12:30 p.m. - Kale salad with Annie’s caper dressing and mayonnaisey chicken salad. This morning, I turned most of last night’s chicken into a chicken salad with celery, dried cranberries, mayonnaise, Dijon, and curry, since chicken never tastes quite as good the next day. I ate it over kale with some store-bought dressing from Annie’s. 3:45 p.m. - Handful of roasted and salted cashews. 5:00 p.m. - Emergen-C packet mixed with water. 9:00 p.m. - Buttery white rice with sautéed spinach and chickpeas. I met some friends for rock climbing after work, so I just did my running workout (sprints) on the treadmill after climbing, then had one of my favorite extremely easy, extremely cheap dinners at home. 9:30 a.m. - Two egg whites and spinach. Okay, normally I’d never have just egg whites, but I used all the yolks over the weekend to make this espresso drink! Added some spinach to bolster it after an at-home workout. 11:30 a.m. - Handful of Backcountry Bundle Trail Mix (cashews, almonds, walnuts, and dried cherries). Realized almost immediately that my egg whites weren’t quite enough so I snagged some office snacks. 2:15 p.m. - Kale salad with Annie’s caper dressing and mayonnaisey chicken salad. The lunch so nice, I ate it twice. 3:00 p.m. - Iced decaf latte and a large slice of King Cake, which Emily and Geoffrey were kind enough to bring to the office! 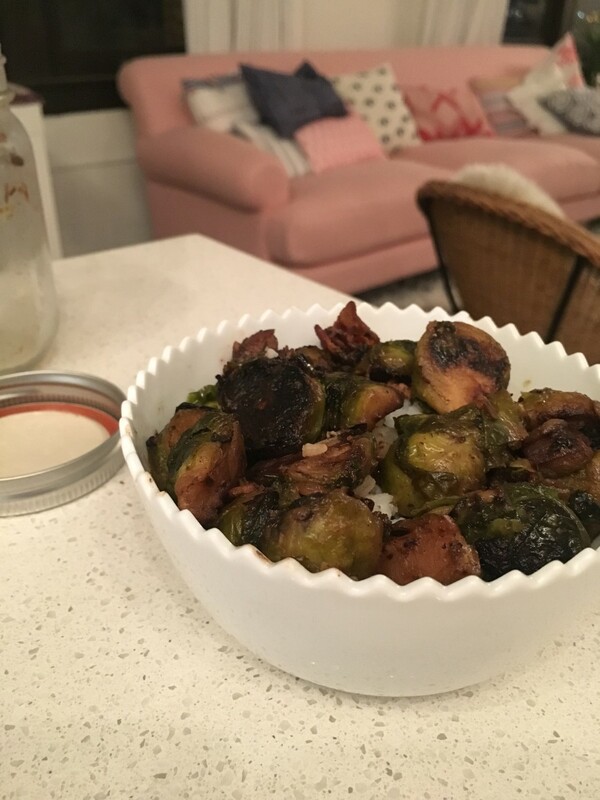 7:00 p.m. - Mason jar packed with white rice and leftover Gjelina’s brussels sprouts with bacon and dates. Today was my brother’s birthday so I met him and a few of his friends at a brewery in Santa Monica after work. I ate this jar of goodies, which I brought to the office along with my lunch, so I wouldn’t have to spend money on dinner and had something in my stomach before getting a beer! 2:50 p.m. - Rice bowl with roasted broccoli, sauteéd spinach, chickpeas, lemon, and soy sauce. 8:00 p.m. - Spicy Thai salad, farro, a glass of whole milk, and 2 glasses of rosé. Since I go on long runs early Saturday morning, my Friday nights are usually very low-key. I loved this salad so much when I had it at a team lunch at Little Sister with Emily, Geoffrey, and Alina last week that I had to try making it for myself. It’s delicious but it isn’t for the faint of heart—it includes raw beef and several Thai ingredients I’d never heard of (Rau Ram leaves?) and my boyfriend and I had to take a break from eating it halfway through to make some farro and get some milk because it was so spicy! 9:30 p.m. - Spiced Sweet Cream and Black Currant Sorbet from Jeni’s Ice Cream in a waffle cone. We live fairly close to a Jeni’s scoop shop—I’m steadily working my way through trying every flavor. Like I said before, I’m so impressed with your commitment to eating high quality food you really enjoy. In terms of tweaks, if you’re looking to make your days a little healthier I would recommend going a bit heavier on veggies, and a bit lighter on added sugar. 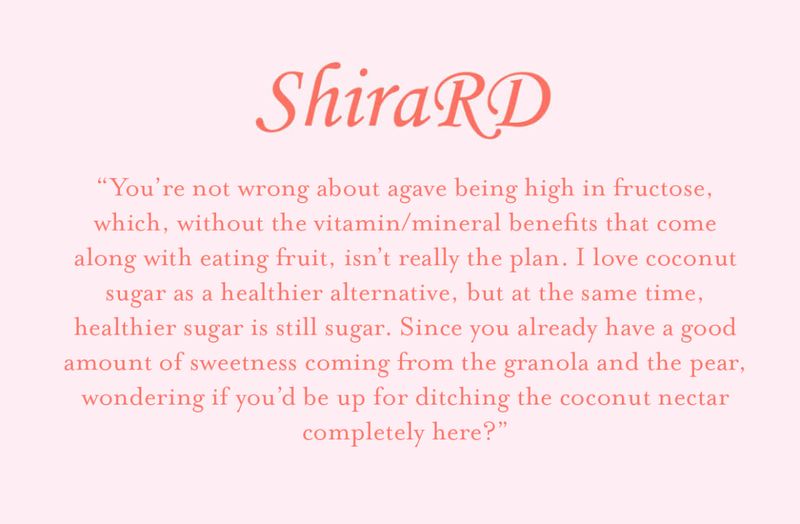 I’m all for you having starches like granola and rice and whole wheat bread, but where you may want to consider scaling back on added sugar are places like: the coconut nectar with your granola (since you’re already getting sweetness from the granola and fruit), the honey in your tea and coffee, and the sugar in your oatmeal. You may even try adding spices like cinnamon and nutmeg and vanilla powder, which offer a natural sweetness without the sugar. 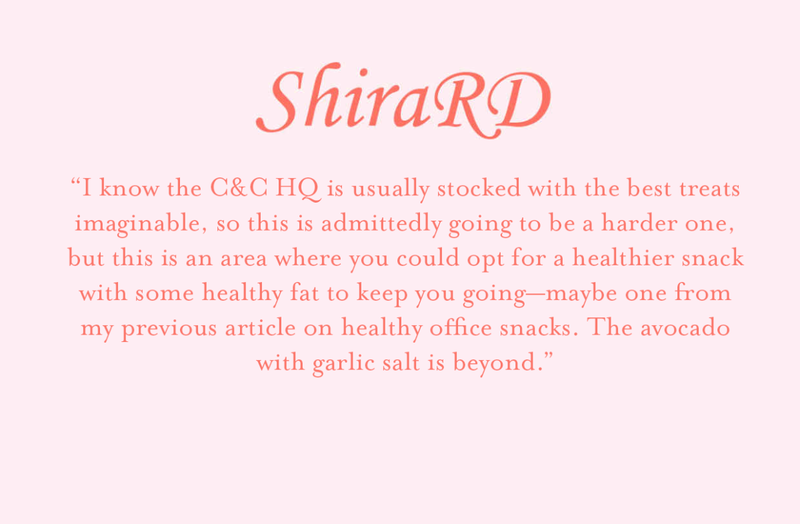 Secondly, since you’re so great about planning ahead, I’d love to see you arm yourself with some tasty office snacks that will satisfy you without breaking the sugar bank. 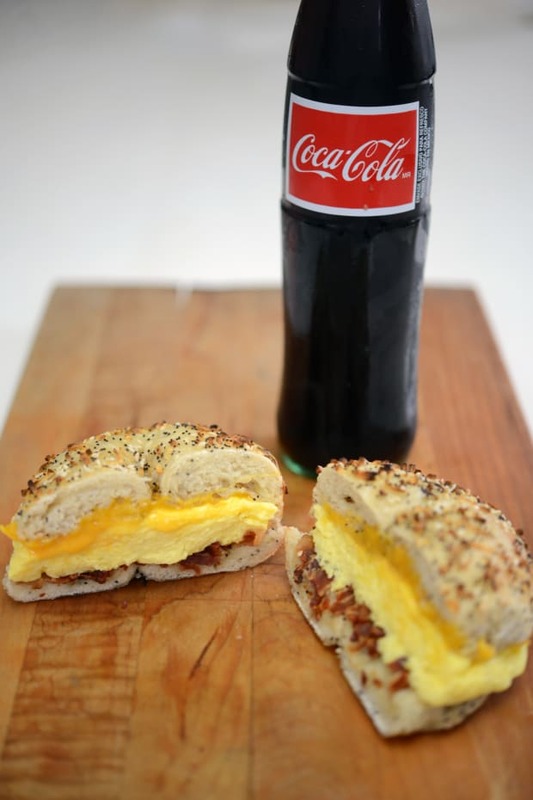 And finally, since you’re so diligent about the whole make-ahead breakfast thing, I’d love to see you alternate between stuff like your granola and fruit, and something a little higher in fat and protein like a frittata in muffin tins that you could enjoy throughout the week. Hope that helps, keep me updated! P.S. 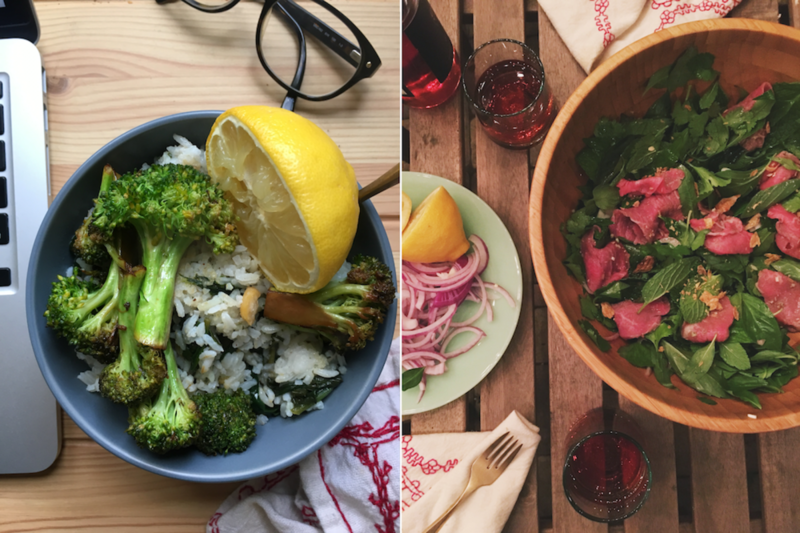 Check out both Emily&apos;s and Alina&apos;s food diaries.